I've also been making Ratatouille for several weeks with our Market bounty. I searched the web for recipes and decided to make up my own. What sets mine apart is that I roast the veggies, use red wine and slow cook it in the crockpot for several hours. Roasted Veggies just our of the oven. Put all of the veggies on a large baking sheet and drizzle with olive oil. Roast for 30 minutes or until golden and soft. Meanwhile mix the seasonings, wine and tomatoes in the crock pot and put on low. When veggies are done, add them to the crockpot and stir to blend. Cook on low for at least 2 hours. Our challenge for this week was to make the Soft Whole Wheat Sandwich Bread on pages 92-93 in HBin5. I made several significant changes to the recipe: I eliminated the eggs, used agave syprup instead of honey and increased the water to make up for the liquid missing due to omitting the eggs. We were to make one loaf, hamburger/hot dog rolls and a loaf of Apple Strudel Bread. I decided to make English Muffins instead of hamburger/hot dog rolls. The plain bread and Apple Strudel bread were fabulous. I didn't like the English muffins so much with this dough - I think because it is slightly sweet. This is the plain loaf. Next time I'll use more dough so that the bread is higher and more suitable for a real sandwich. The texture and taste was amazing. It stayed fresh for several days. The Apple Strudel Bread was wonderful I used apples and almonds, since that is what I had. The texture was wonderful. We thought it was similar to those little pecan twirls you can buy at the grocery store bakery. In fact, I think I'll try making those this afternoon. For our first official Bread Braid, we were to use the Master Recipe in HBin5 and make three separate breads: one loaf, one Epi or Wreath shaped bread and Spicy Whole Grain Snack Crackers. What I love about these HBin5 and ABin5 doughs are that you only have to mix up ONE batch of dough and there are so many things you can do with it. The loaves aren't baked in the forms. You generously flour the forms, put the dough in them to rise and then, ever so gently, turn them out onto the baking surface to bake. Gorgeous! Next up were the Epi and Shaped Wreath. This was a challenge - the technique is hard to grasp through photos (for me anyway.) I gave one to a neighbor and ate the other - just for research purposes of course!! I had hoped to bring these with me to a New Year's Eve dinner, but they ended up in the trash can - much to my dog's horror!! I was very pleased with how it looked and tasted. I highly recommend the book if you are interested in trying agave. Thanks, Weelette, for the great Christmas presents. Love ewe. If all the Morgains in the world were in a room, I'd pick YOU!! ...........That's what I used to tell my oldest daughter when she was a little girl!! Well, my "little" girl is now married and recently discovered ABin5. I suggested she make english muffins - because they are incredibly amazing! So, I thought I'd put up directions to help her (and maybe others) out. 1. 18 oz of dough Master Recipe from either ABin5 or HBin5. Cloche the dough and divide into 6 pieces. On a separate board, sprinkle a little cornmeal to place your muffins while they rise. 6. After 5 minutes is up, put muffins in the oven for another 5 minutes. Let cool ~15 minutes. Poke around the edges with a fork - do not cut these open with a knife!! Then, carefully, pull the top and bottom apart.........................NOOKS n'CRANNIES!!! 7. Put in the toaster and top with butter. YUMMMY!!! The second bonus bread for the Healthy Bread in 5 is a delicious Whole Grain Challah with Cranberries, Orange and Walnuts. I had leftover Cranberry Relish that I had frozen after Thanksgiving, so I used that in place of the orange zest, dried cranberries and nuts. It turned out great! I made half the recipe again - after all there are just two of us! Based on reviews from other HBin5 "Braiders" I added an extra teaspoon of Vital Wheat Gluten and used White Whole Wheat Flour. While I didn't get much of a rise in the oven, the texture and taste are wonderful. I'm wondering if the lower oven temp has something to do with the lack of "spring." You'll have to head over to Michelle's blog for the recipe - she's our fantastic leader. Using half the recipe, I was able make two braids and one crown. Here they are before rising. Look at that crumb, baby!! Moist and delicious. Our younger daughter LOVES the bread at Outback Steakhouse. I found this copycat recipe years ago and have been making it ever since. There are several versions on the web. This one doesn't have any food coloring, cocoa or coffee used to replicate the deep brown color of the restaurant bread - which is why I like it! In a small bowl, combine 1/2 cup of warm water, yeast and sugar. Let sit until bubbly. Meanwhile, in a large mixing bowl (I use my Kitchen Aid Stand mixer) combine 1 cup warm water with the molasses, salt, oil and rye flour and yeast mixture. Beat to a smooth batter. Then add 2-1/2 cups of the all purpose flour. At this point, switch to the dough hook if using a stand mixer. Continue to add all purpose flour until a ball forms and cleans the side of the bowl. It should be very pliable and moise, but not wet. Form into a ball and put in a greased large bowl to rise for ~1 hour until doubled. Gently punch down dough and form into 2 large or 4 small loaves. Place on a baking sheet dusted with cornmeal. Let rise to double again, a little less than an hour. Preheat oven to 375. Bake for 30 minutes. Start checking small loaves at 25 minutes. Upon removing from oven, brush with melted butter. Let cool on racks. Freezes very well. I can't believe it's been over a year since my last entry. I recently joined another bake-along group. 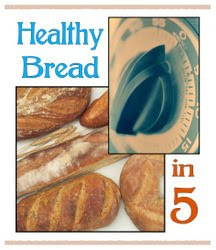 We are going to be making the breads from the new book Healthy Bread in 5 Mintues a Day. We don't officially start until January, but were offered the option of making the Pumpkin Pie Brioche (it is that time of year after all!) I really enjoyed making this bread - I made a few modifications: I used an egg substitute, extra light olive oil and agave syrup. I also added cinnamon, ginger, cloves and nutmeg to the sugar I sprinkled on top of the loaves. Very tasty - the flavors definitely become more pronounced a few days after baking - if it lasts that long! I made a 1/2 recipe, which you can see yielded 2 medium boules and a mini boule. If you want the recipe, you'll need to head over to Michelle's site - she's our leader. And even if you don't want the recipe, you should visit anyway - it's a great blog. Oh - and to try and keep myself from gaining EVEN more weight, I ran my very first 5K this morning!! Nine weeks ago, I had not run in over 20 years. I started the Couch to 5K running program. AWESOME!! This program, over the course of 9 weeks, takes you from sitting on your couch to running 30 minutes. Now, for some people (me not being one of them ;p) 30 minutes is the amount of time to run that distance. Today, for the first time ever, I ran 5K (a little longer than 3 miles!) Thanks C25K!!! Married over 26 years with two grown, "launched" daughters. When I got married at 18, I didn't know how to cook - I've spent the past 26 years teaching myself. I also enjoy digital photography, travel, quilting, knitting, exercising and spending time with my family.